When the Commissioners’ Plan for the grid system of NYC streets was adopted in 1811 and John Randel Jr. set about surveying the island as related in the Museum of the City of New York winter 2012 exhibition and the book “The Greatest Grid,” the survey was laid out only as far north as 155th Street. City planners were under the impression that development of territory north of that would take well over a century, so there was no great urgency to survey there. As we now know, it took only about 65 years for construction and layout of streets to reach 155th. 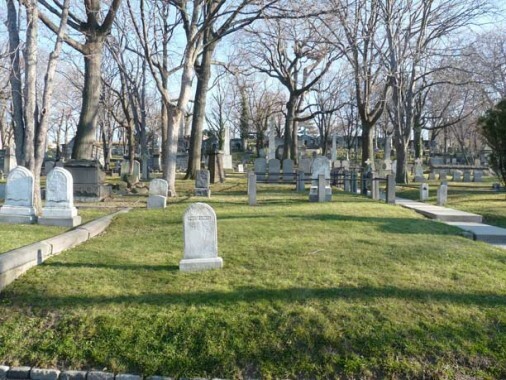 When the Trinity Church cemetery at Broadway and Wall Street had reached capacity by the early 1800s (interments had taken place there since the mid-1600s) the church sought out additional land and, in 1842, purchased a 23-acre stretch between today’s Amsterdam Avenue, Riverside Drive and West 153rd-155th Streets (originally, the purchase touched the Hudson River) from landowner Richard F. Carman (see below), who was building a village of his own along the Kingsbridge Road, which we now know as Broadway. 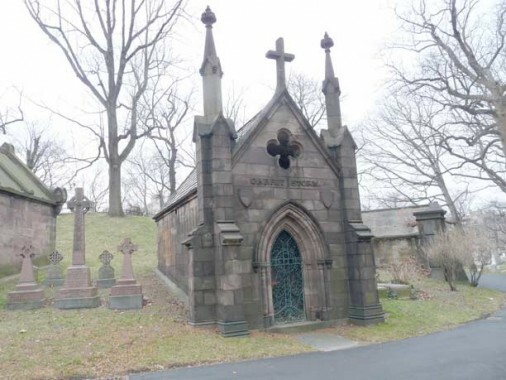 At the time, as far as most Manhattan residents were concerned, this far north was Ultima Thule, although Trinity had also considered parcels in Morrisania in the Bronx and even a section of Green-Wood Cemetery, which had been established in 1838 in far-off Brooklyn. 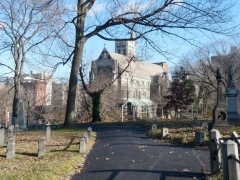 James Renwick Jr., the architect of St. Patrick’s Cathedral, Grace Church and the Smithsonian Institution Castle Building in Washington, was brought in to landscape the cemetery and design its sweeping walks and paths; later, Calvert Vaux designed a now-vanished bridge (standing between 1872-1911) spanning Broadway, which was straightened on a path that bisects the cemetery into two nearly equal divisions (it’s one of the few NYC cemeteries divided in this manner). 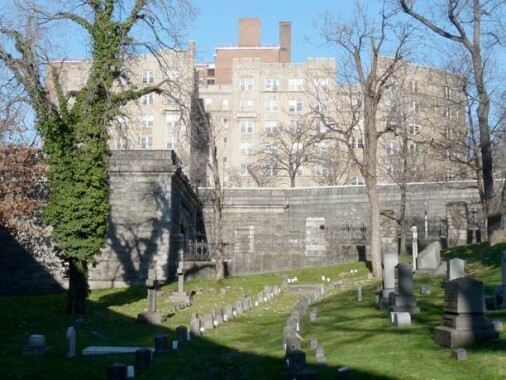 From the start, despite its remoteness as well as the relative difficulty in traversing its western section, which is built on high, ungraded hills, Trinity Cemetery Uptown (not its official name, but I call it that out of convenience) was a popular tourist destination, as many cemeteries such as Green-Wood, Woodlawn in the Bronx and Mt. Auburn in Cambridge, MA were designed to be before the days of large public parks. In December, on one of the few wintery days of 2011-2012 (I classify a day as ‘wintery’ if the temperature doesn’t get above freezing) I accompanied historian Eric K. Washington and several hardy cemetery buffs on a walk in the western section. A few days later, I returned for a look at the rest of the western section, which was open, but crossing to the eastern section, found it locked (the cemetery keepers are somewhat capricious). I returned again some days later, and finding the gate open, completed my own survey, using a brochure I had obtained from the cemetery office. Entering the western end of the cemetery first. There’s a small and inconspicuous entrance at Broadway and West 155th, which may or may not be open; the best bet is one of the two side entrances on West 153rd and West 155th, which entail a long walk downhill and hence, a long walk uphill coming back. 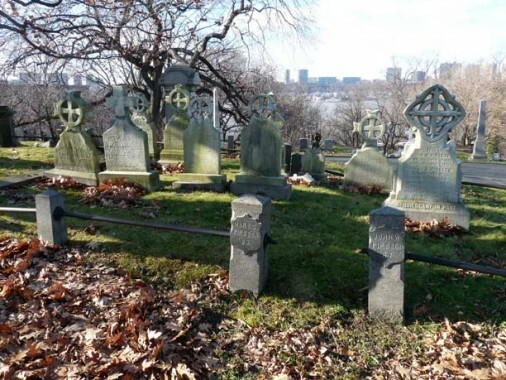 While the central part of the cemetery’s western division is on a high hill, the western end slopes down to the Hudson River; you can see the gradual pitch in this photo, wich also shows one of the large apartment buildings on Riverside Drive facing the river. Before long you arrive at the gravestone of Clement Clarke Moore (1779-1863), who is popularly credited with writing the Christmas perennial A Visit From St. Nicholas. The poem is credited, along with Thomas Nast’s accompanying artwork, with “systematizing” The Jolly One’s appearance of a jolly old elf with a white beard, eight reindeer (Johnny Marks added Rudolph to the team a century later) pipe and red robes. The legend of Santa Claus, though, is still shrouded in a haze of mystery, for me, at least. His original identity as a saint has been mostly glossed over as religion has taken a back seat in pop culture. But who originated the legend of Santa Claus operating a toy factory at the North Pole with elves as slave labor? 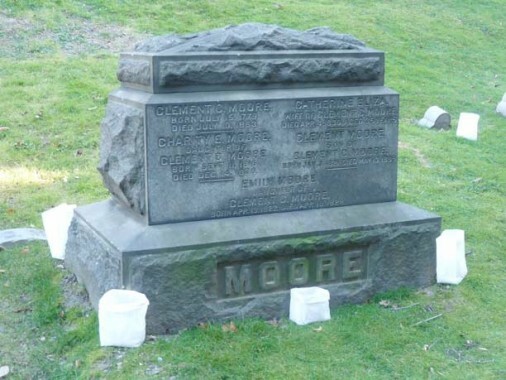 Moore himself was the son of Trinity Church rector Benjamin Moore. Period engravings show a kindly-faced man whose visage seems to match the genial work depicting a visit from Santa. 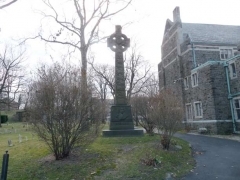 By trade, he was an educator and writer — he donated land to the Episcopal Church for the General Theological Seminary on 9th Avenue and 20th Street, where he later taught. His estate there was called Chelsea and the surrounding neighborhood continues to bear the name. He seems to have been a pragmatist. He vehemently opposed the development of Manhattan according to the new early 19th Century street grid plan, but he later took advantage of it, selling lots along 9th Avenue to rich investors. He opposed abolition and was a slave owner. 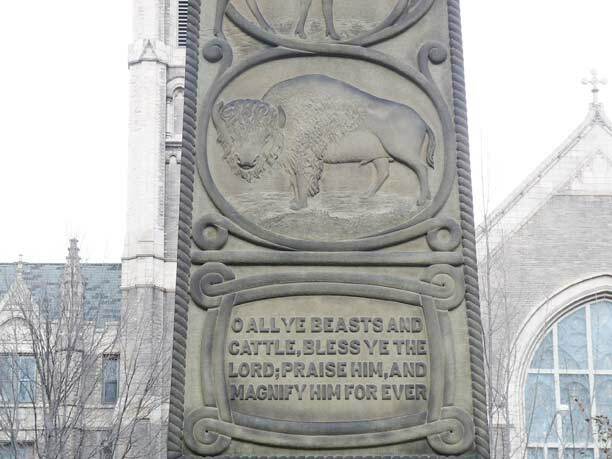 The poem ascribed to him was first published in the upstate Troy Sentinel on 12/23/1823. Whatever doubt of its origin comes from the fact that it was published anonymously, and others have claimed authorship in the ensuing decades. He later acknowledged he was the author in letters to his own children, and included it a published book of verse in 1844. 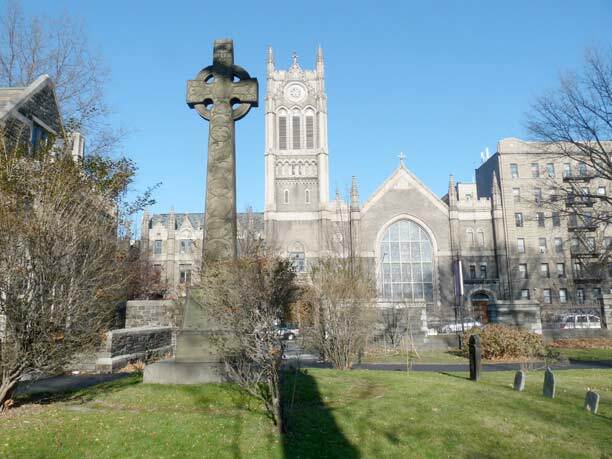 Upon his death he was interred in St. Luke in the Fields in Greenwich Village–he had helped organize St. Luke’s in 1820–but in 1899 he was reinterred here in Uptown Trinity. Surrounding his family’s stone are some candles–each December, there is an evening procession from the Church of the Intercession to his gravesite. Near Moore’s stone is that of Dr. David Hosack (1769-1835). 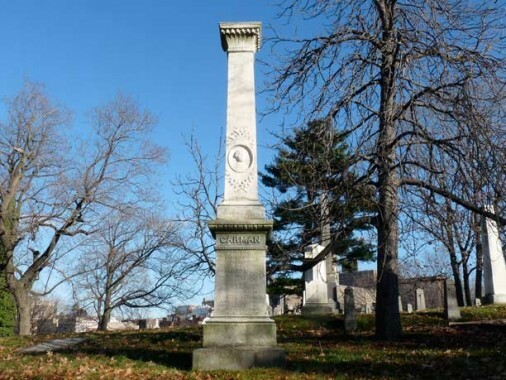 In 1801, he treated Philip Hamilton after a fatal duel in Weehawken, NJ; three years later, he found himself in the same situation, as he unsuccessfully ministered to Philip’s father, Alexander Hamilton, after a duel with Vice-President Aaron Burr. After Alexander Hamilton had fathered a child a year after Philip’s death, the baby was also named Philip. Hosack was also a botanist and educator and in 1801 founded the Elgin Botanic Garden near what would later become Rockefeller Center. He was originally buried at Grace Church (Broadway and East 10th) but was reinterred in Uptown Trinity in 1888. Dr. David Hosack went on to have several children, including sons named Nathanael Pendleton Hosack and Alexander Hosack. Alexander Hosack followed in his father’s footsteps and became a prominent physician, tending to Aaron Burr in his final years. According to Alexander Hosack’s 1871 obituary in the New York Times, he once asked Burr if he felt any remorse over Hamilton’s death. Burr reportedly said that he suffered no remorse, and that Hamilton had brought his death on himself. Nathanael Pendleton Hosack was a vestryman at Trinity Church. This is a look east from the bottom of the hill near Moore’s and Hosack’s stones. A path winds around the hill, gradually ascending the hill. Surprisingly many of the graves are obscured and placed behind other ones, so they’re either hard to find or somewhat inconvenient to clamber toward and view, but the hilly topography was no help in the Renwick layout. Wealthier families were able to install large tombs and sarcophagi; the upsloping territory allowed for easier construction. 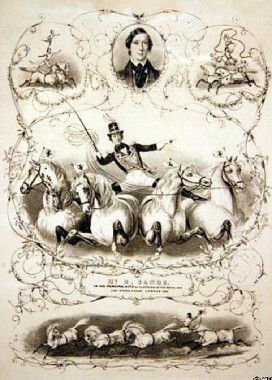 The next monument of note is that of an entertainer and impresario, Richard Sands (1814-1861), an accomplished acrobat who popularized “ceiling walking” with the aid of suction-adapted footwear, though he first attained fame as a teenager by performing somersaults on charging horses. He later owned several circus companies. Although press reports in 1861 had Sands falling to his death from an unsuccessful ceiling walk, he died from yellow fever during a visit to Cuba. Soon after, another sailing ship, the Mexico, also foundered in the same area, leading to reforms in the pilot process. Is there a signer of the Declaration of Independence in Uptown Trinity? No, despite what this marker states. 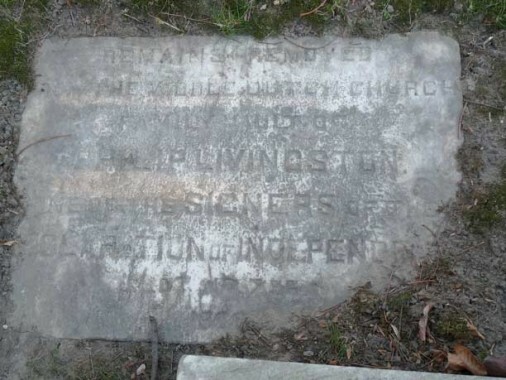 Philip Livingston (1716-1778), a member of the Continental Congress, is buried at Prospect Hill Cemetery in York, Pennsylvania, where he had died — despite what the Washington Heights Chamber of Commerce tells you. It’s easy to understand why they were taken in, and the origins of this erroneous marker are as yet unknown. 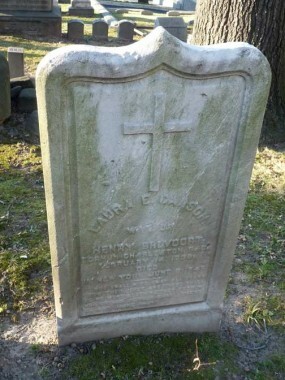 Henry Brevoort (1782-1848) and his wife, Laura Carson Brevoort. When 11th Street was being laid out downtown in the 1810s, Henry Brevoort was one of the few landowners in the area with enough pull to prevent a street from being built, as his apple orchard stood in the way. Hence, there is no 11th Street between Broadway and 4th Avenue; instead, the magnificent Grace Church, completed in 1846 by James Renwick Jr., a cousin of the Brevoorts, stands there today. Brevoort was a great friend of Washington Irving’s, and their voluminous correspondence survives today. 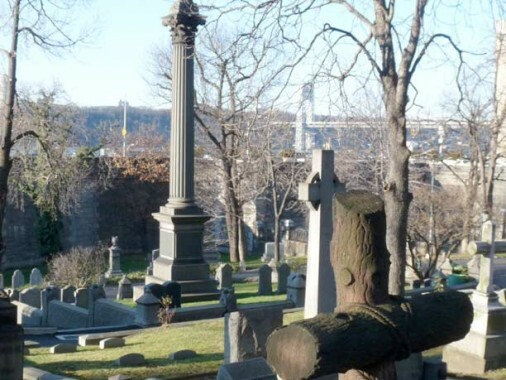 The George Washington Bridge can be seen, especially in winter, from the cemetery. 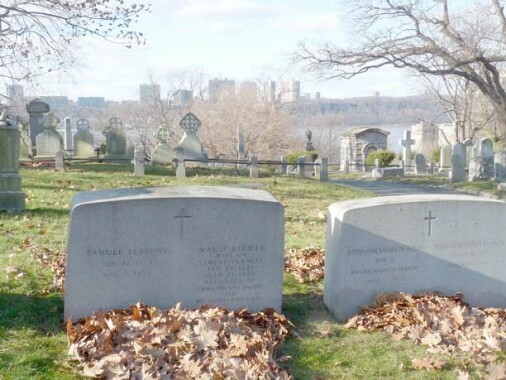 At least two NYC mayors are buried in Uptown Trinity, and another one will be (see below). 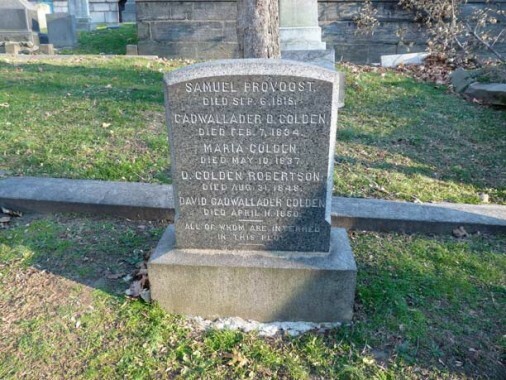 Cadwallader David Colden (1769-1834), born in Queens, was mayor from 1818-1821 and then became a US Representative from New York from 1821-1823. He immediately followed his close friend, DeWitt Clinton, as mayor. In City Hall, he spearheaded the House of Refuge, basically a homeless shelter for teenagers and young adults; it opened in an armory at what would be the future Madison Square in 1825. He also championed a national canal system in Congress. His grandfather Cadwallader Colden was a Tory whose enforcement of the Stamp Act moved the citizenry to hang him in effigy. 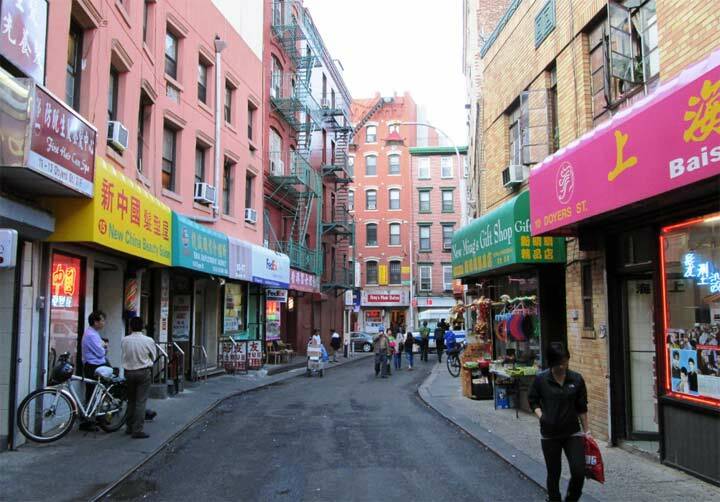 The family was prominent in the colonial era in Flushing, and one of the north-south streets there is Colden Street. 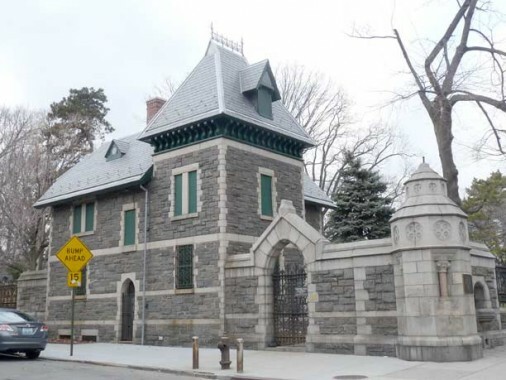 There is also a Colden Avenue in Morris Park, Bronx, where the north-south streets bear 19th Century mayors’ names. The Bradhurst and Jumel mausolea are side by side on a hill. Both families are remembered in NYC street names; Dr. Samuel Bradhurst was a physician who held property in Washington Heights. The penniless beauty Eliza Bowen acquired a life of luxury upon her marriage to Stephen Jumel, a wealthy French wine merchant who bought the elegant Morris Mansion for her in 1810. Born in Providence, Rhode Island, to a prostitute named Phebe Kelley Bowen and a sailor who had been her lover, the stigma of illegitimacy and life in the local poorhouse fired Eliza’s obsession with wealth and social status, and she would later claim to have have been born on the high seas, the daughter of a French naval officer and his aristocratic English wife. 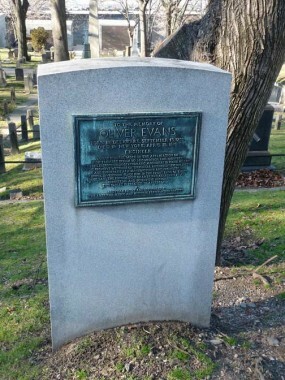 Engineer, whose pioneer work in the application of high pressure steam to locomotion and industry with the introduction of automatic machinery in flour milling; whose creative writings on technical and scientific subjects and enterprise as a manufacturer and promoter of useful inventions place him in the front rank of those who laid the foundations of America’s greatness as an industrial and scientific nation, this tablet is erected in appreciation by Greveille Bathe and sponsored by the American Scenic and Historic Preservation Society. Looking down on the Astor family plot. John Jacob (1763-1848) is interred here; he made a fortune from the fur trade and later in real estate and became the richest man in the USA for a time. His name is remembered in such diverse spots as Astoria, Queens and Astoria, Oregon (from the expansion of his fur empire in the Northwest). He bequested little money to NYC, keeping it with his family; the landholdings have kept the family fortune intact for generations. In 2012, literature fans celebrated Charles Dickens’ bicentennial. The great author was one of the first to popularize the book tour and his works, which appeared mostly in serial form, were greatly anticipated. Classics like Oliver Twist and David Copperfield, which champion the lower and middle classes and expose the hard life they were forced to lead in 19th Century Britain, sell just as steadily today as they did when they originally appeared. 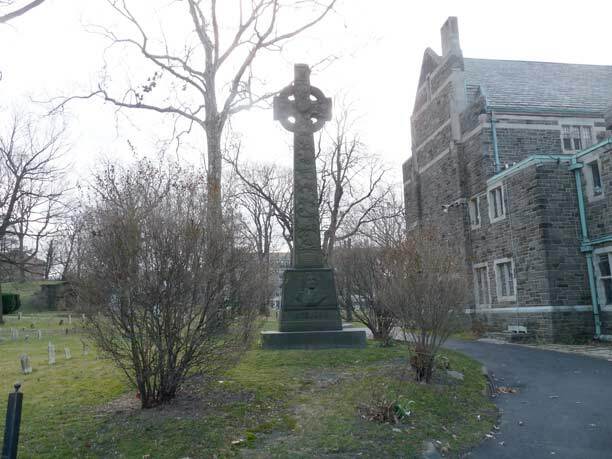 Charles’ son, Alfred Tennyson Dickens (1845-1912) lies in Uptown Trinity, marked by a small stone close to the Broadway cemetery entrance. He toured the world as a lecturer on his father’s life and work. While visiting the USA in 1912 (staying at the Astor Hotel) he was stricken by a sudden illness and passed. 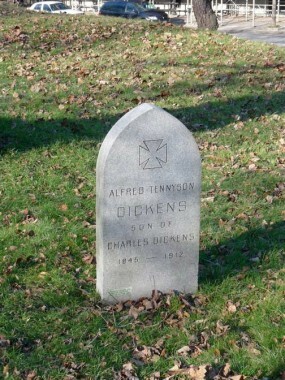 Trinity Cemetery donated the plot and A. T. Dickens was interred here rather than in his native England. Thus the author of A Visit From Saint Nicholas and the son of the man who wrote A Christmas Carol are both in Uptown Trinity. Known for his ability to synthesize styles, his projects show Gothic, Romanesque, Art Deco and Spanish-Revival influences, among others. His many commissions include the Nebraska State Capitol; the Master Plan for the California Institute of Technology; the campuses for Rice and Princeton Universities; St. Thomas Episcopal Church, New York City; and the site plan and Spanish Colonial Revival style buildings for the 1915 Panama-California Exposition in San Diego’s Balboa Park. 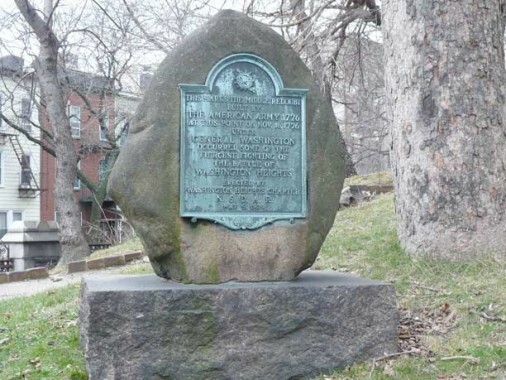 The stone of Samuel Seabury (1873-1958), a descendant of the first American Anglican bishop. Seabury was a renowned jurist who headed the Seabury Commission in the 1930s, investigating corruption in Tammany Hall, leading to the resignation of Mayor Jimmy Walker. He was an unsuccessful candidate for NYS Governor in 1916. Family plot of the Pirsson family, featuring numerous Celtic crosses. 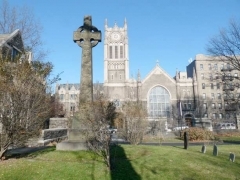 The crosses, which feature a ring surrounding the cross, are prominent in Uptown Trinity. 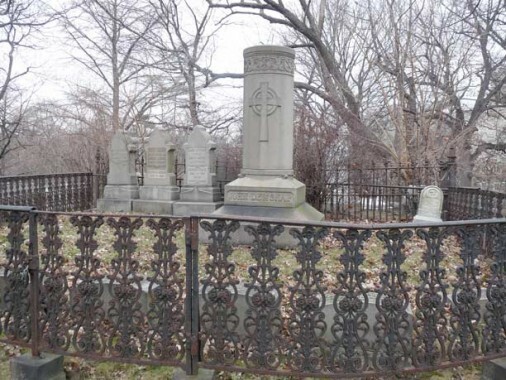 The gravesite of Richard F. Carman (1801-1867), who sold 23 acres of his uptown property to Trinity Church in 1842. Carman was a box manufacturer who made a fortune in real estate and insurance and was a near neighbor and friend of the family of John James Audubon (see below.) 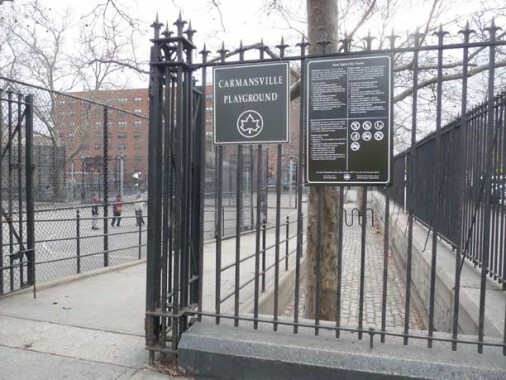 He founded the village of Carmansville along today’s Amsterdam Avenue between West 150th-153rd Streets, and a playground is named for the village. 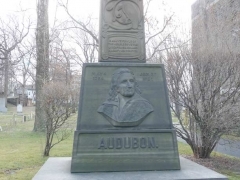 Jean-Jacques Audubon was born in what is now Haiti on his sea captain father’s sugar plantation, and grew up near Nantes, France, emigrating to the USA in 1803 to avoid serving in the Napoleanic Wars, becoming a citizen in 1812. He had always expressed an interest in nature and the outdoors and especially in birds; in 1820 he traveled to the American South to begin his massive project of painting every native bird species in America. At first he could not find a publisher in the States, but his drawings became a sensation in Britain and Birds in America, today an unparalleled classic of its genre, gradually found release between 1827 and 1839. The story of Audubon’s monumental memorial, installed in 1893, is lengthy. The Church of the Intercession has competition across the street, at least in the tower department, from the North Presbyterian Church across West 155th. 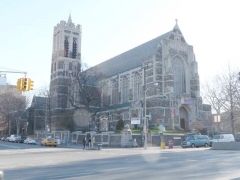 When it was organized in 1847 it was Congregationalist church, only becoming associated with the Presbyterians (as the Washington Heights Presbyterian Church) in 1858. 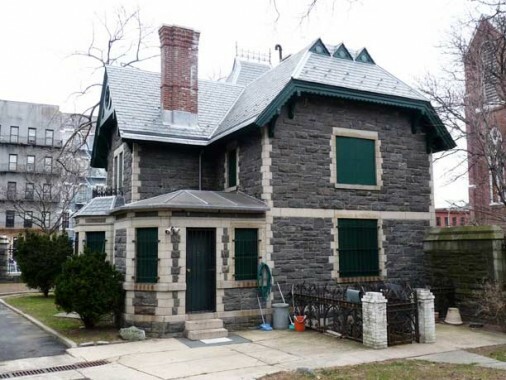 The construction of this building between 1900-1905 ended the City’s plans to extend Audubon Avenue south to West 155th, where it would have begun opposite the Audubon monument in Uptown Trinity. 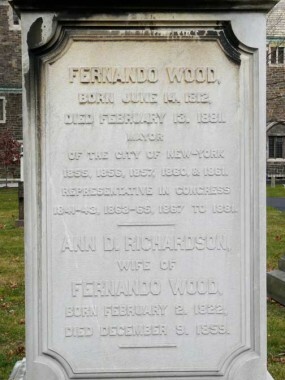 Another NYC mayor, Fernando Wood (1812-1881), is buried in Uptown Trinity on the eastern division. He served two separate terms from 1855-1858 and again from 1860-1862, and was a US Representative from NY from 1841-1843, 1863-1865 and 1867-1881. He was born in Philadelphia and was a Copperhead during the Civil War (a Southern ally living in the North) and suggested NYC secede from the USA in order to protect the city’s trade with the Confederacy. In the 1856-57 session, Republicans in control of the New York State Legislature at Albany shortened Wood’s second term of office from two years to one, and created a Metropolitan Police Force, with Frederick Talmadge as superintendent, to replace Wood’s corrupt Municipal Police. Talmadge demanded that Wood disband the Municipal Police, but Wood refused, even in the face of a May 1857 decision by the Supreme Court. Superintendent George Washington Matsell, 15 captains and 800 patrolmen of the Municipal Police backed Mayor Wood. [Police] Captain George W. Walling pledged his loyalty to the new Metropolitan Police and was ordered to arrest Mayor Wood. Wood refused to submit and when Captain Walling attempted force, New York City Hall was occupied by 300 Municipal policemen, who promptly tossed Captain Walling into the street. Fifty Metropolitans in frock coats and plug hats then marched on City Hall with night sticks in hand. The Municipals swarmed out and routed the Metropolitans. Fifty-two policemen were injured in the New York City Police Riot. 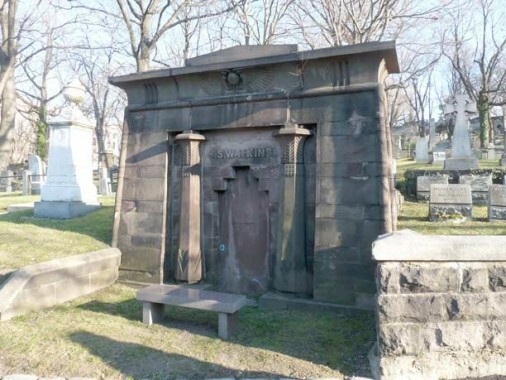 The mausolea of Garrit Storm (above) and Stephen Storm (below). 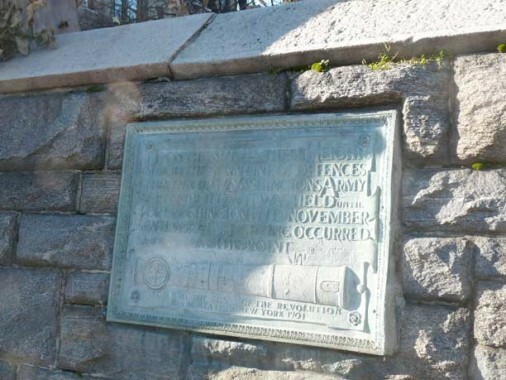 Two Revolutionary War memorials marking the Battle of Harlem Heights, Washington’s only victory over the British in NYC, can be found at Uptown Trinity, one within the grounds installed in 1929 by the Daughters of the American Revolution and an older one, from 1901, on the wall at Broadway and West 153rd. High ground within what became the Cemetery was the patriots’ first line of defense. I’m now in the hilly area on the eastern side. This is the gravesite of John Dewsnap and family. Besides no one having a name like Dewsnap anymore, I was fascinated by the intact fences and gates surrounding the plots. Some of these gates have been there since the 19th Century. 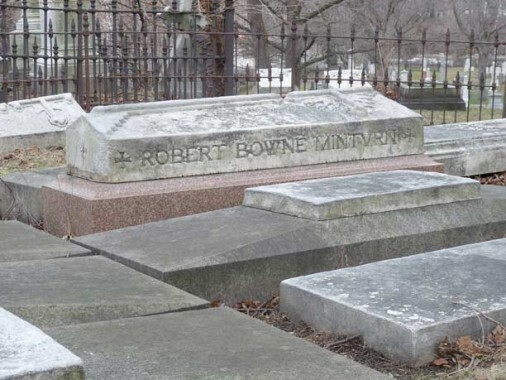 The resting place of Robert Bowne Minturn (1805-1866), a descendant of John Bowne, the Quaker who defied Peter Stuyvesant in 17th Century Flushing, Queens. Minturn was a merchant shipper who owned the Flying Cloud, which in 1854 set the speed record for sailing between New York and San Francisco (89 days 8 hours). In those days, without a Panama Canal, ships had to go around Cape Horn, the southern end of South America. Minturn also donated land in mid-Manhattan that became part of Central Park. 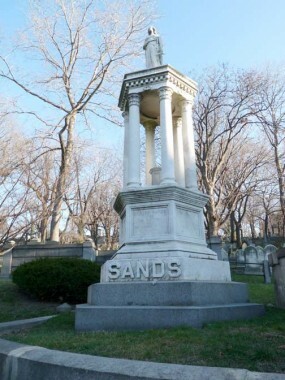 Henry M. Sands’ tomb, which requires a lot of clambering to get to. A rusted, broken gate featuring a trefoil, a symbol of the Triune Deity, vainly tries to protect it. Caretakers’ House, West 153rd near Broadway. A feature of Uptown Trinity since it opened, it is built into the side wall. Place looks great– a far cry from the ugly 1970s and 80s. 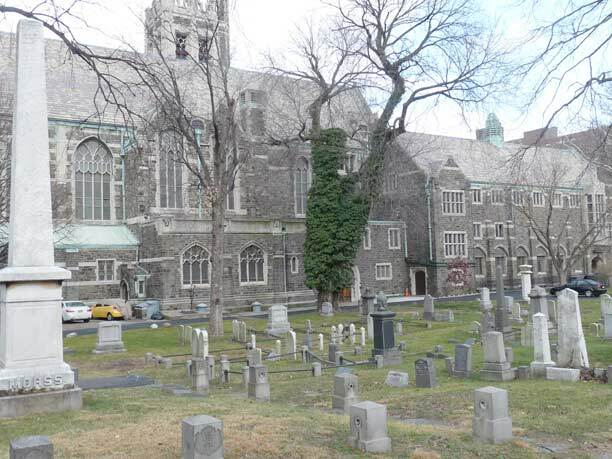 Did I see mention that this cemetary was featured in the movie the Royal Tenenbaums? Love your website. 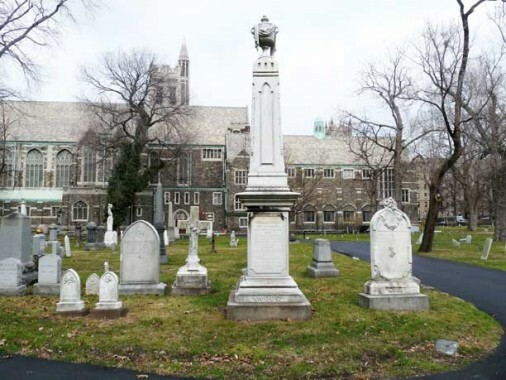 I grew up right next to Trinity Cemetery at 780 Riverside Drive in the 60s,70s and 80s. As a kid we never knew it was open. In the winter time we would go sledding down “Dead man’s hill”what a grat time we had. WHOA. What an amazing story you made out of one cemetery visit. A very nice way, indeed, for newcomers and New Yorkers alike to get to know the rich history of NYC. But who lives in caretaker house? This is a very long shot (6 years later) but, did you really used to live there? Do you know what the status of it is now? Well done. I particularly enjoyed the historial background. Until I saw that gravesite for Koch, I didn’t think that they were doing new burials there. Great job! I love this site. The old New Yorkers and their stories are a welcome accompaniment to the photos. Brilliant, Brilliant, Brilliant…. ! You bring the streets alive for us, and make a stroll an experience, and I thank you for your hard work and for loving this city, it’s people, and it’s history enough to do all you do to preserve and memorialize them all. Thank you for bringing the city to life for those of us who only saw cement and brick before, but now see the hands that laid them and the feet that tread upon them. Your work is a gift to us and the generations to follow who will be equally enthralled with your work. Yesterday, Apr. 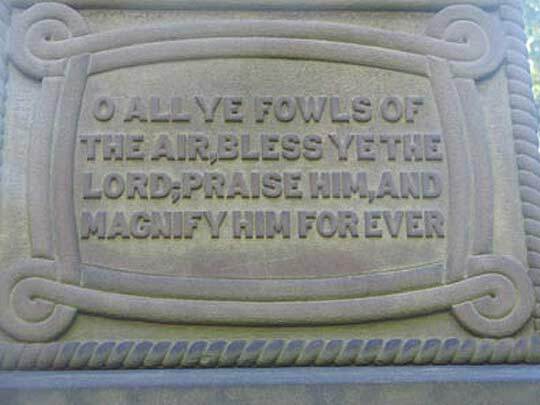 26, 2012 I visited the Birdman’s grave site and was surprised to see that the birth date inscribed on his monument read May 4, 1780!.. I thought Audubon was born on Apr. 26, 1785?.. Something needs to be done to rectify this! Thought the article was great. 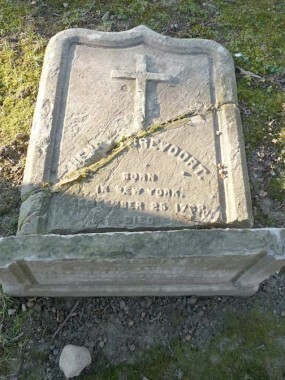 One item interested me as my family is buried on Riverside Drive. 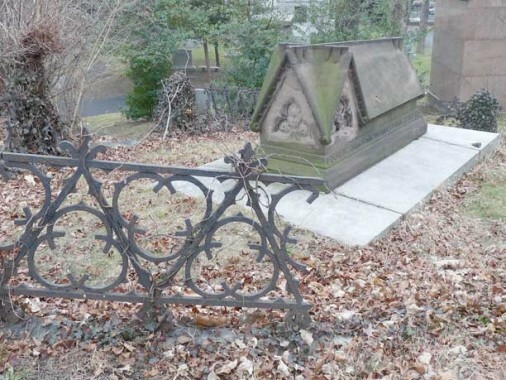 Dr. Samuel Bradhurst is buried in the Schiefflein tomb at the Old Trinity Church. 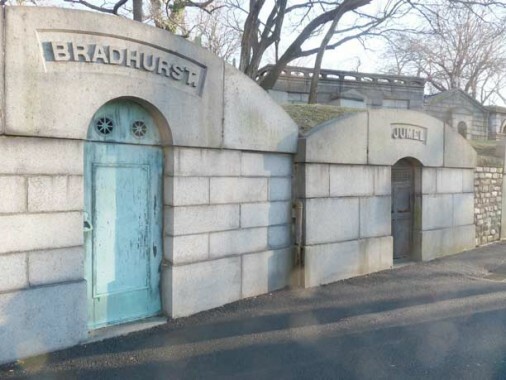 John Maunsell Bradhurst, his son and various other Bradhursts are in the vault on Riverside Drive. 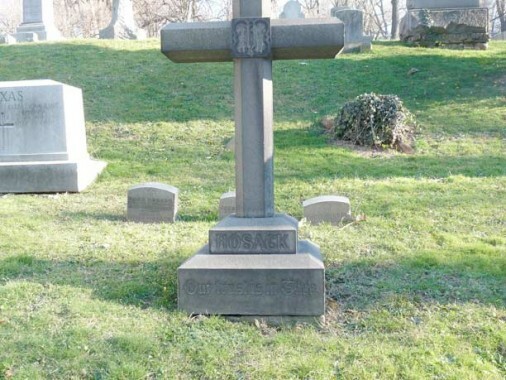 My Great grandmother, Mary Elizabeth Bradhurst Jackson is buried near the wall on Riverside Drive. Thought I would keep the information straight regarding Dr. Bradhurst. 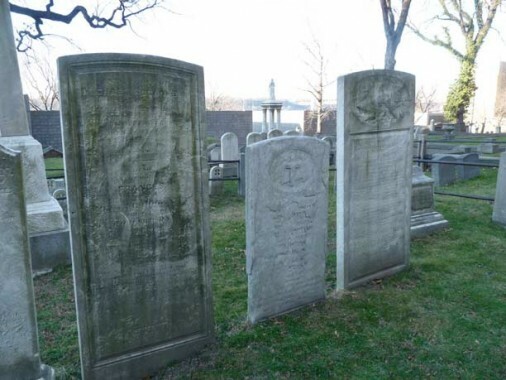 I found your site after hearing that Mayor Koch will be buried in “Trinity Cemetery”. 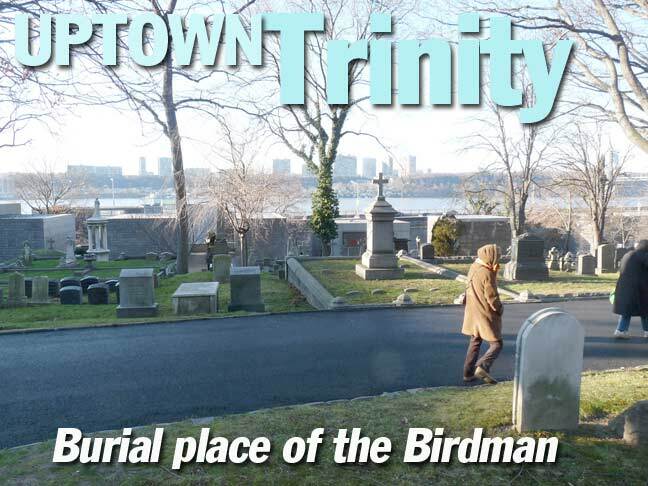 I knew about the Trinity Church Cemetery downtown, but never heard about Trinity North. I enjoyed seeing the photos and reading the history. Thank you. 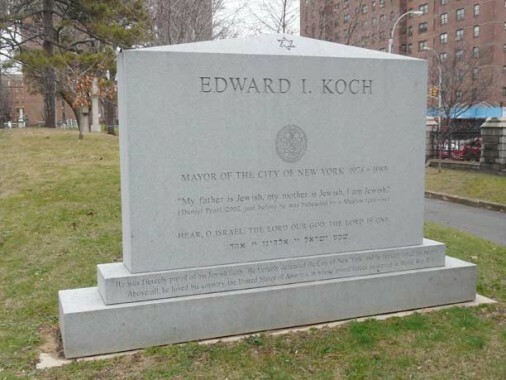 I had heard that Mayor Koch had bought a grave here, a place unknown to me. 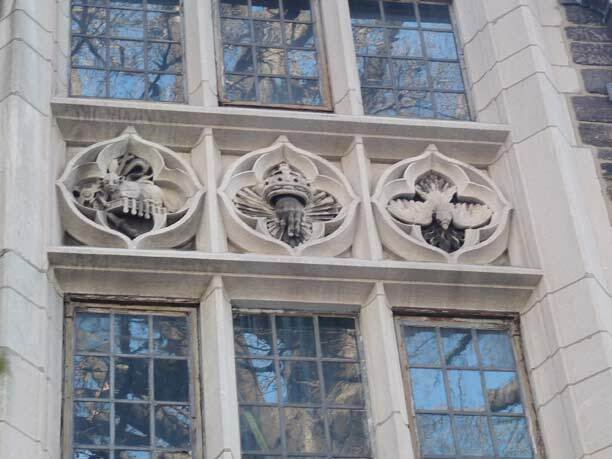 My first job in NYC, seventy years age, was at 1 Wall St. We looked out our ninth floor window ,across Broadway, into Trinity Church Graveyard, a beautiful spot then and now. I am so pleased to have found this website and all its grand information. Another beautiful place. I love also the tombstone Mayor Koch installed and its inscription…Bravo…and farewell to a great mayor. A great website. So much history. 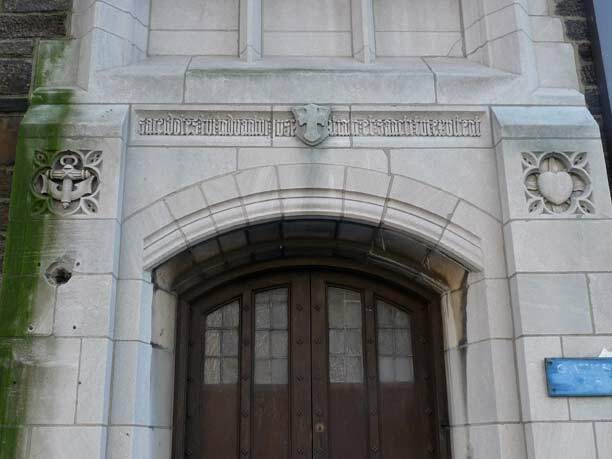 While serving in the U.S. Navy in 1945, I visited Trinity, but am a little confused. I remember Trinity Church as being a very small, quaint little Church. Remember walking around and observing many of the famous graves. Walked up Wall Street and seems we walked straight into the Cemetery and up to the Church. Although a wonderful memory, apparently I am wrong. Is there a smaller chapel just inside the gate? 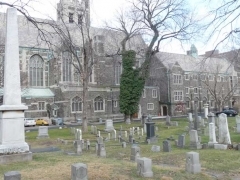 In the late 40’s my family and grand parents lived at 400 West 154th Street and Saint Nicholas Ave. On weekends the family would take long walks around the neighborhood and sometimes walked the perimeter of the Cemetery. We never knew the history of the Cemetery and we never went inside the gates. There’s an area across Amsterdam Ave that is surrounded by a brick wall. We could never see inside the grounds and it seemed that there was no way to get on to the property. 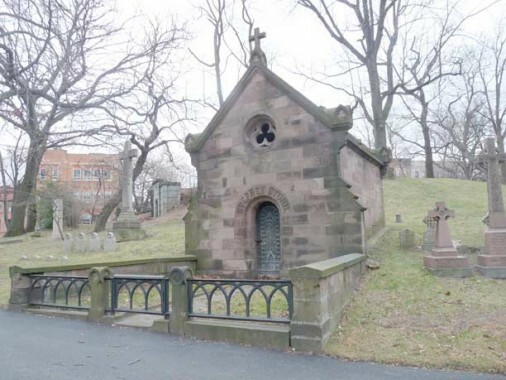 Is this an extension of the Trinity Cemetery? 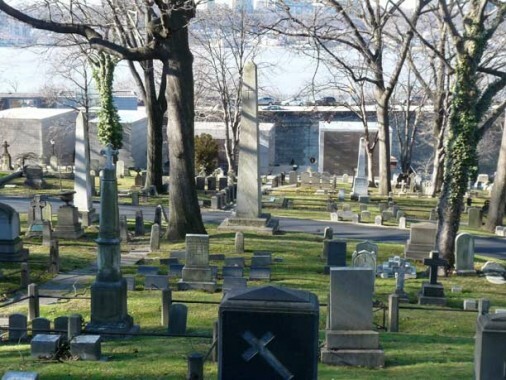 On my next visit to Manhattan, I plan to visit the Cemetery. 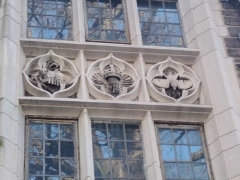 I once resided in Manhattan at 487 W. 135 St.and was looking up information concerning the school I attended, when I found “Forgotten New York”..So much has changed! When I was about 5 yrs. of age we lived at 152nd St. often my mother would take my sisters and I for afternoon walks to the Trinity Church Cemetery where she would find a bench and we could play. The Amsterdam Avenue entrance was always open. At the time, I didn’t realize how much this cemetery and the church would influence my life. We moved to 135 St. when I was nearly 7yrs. On Sundays, daughters of a good friend who lived nearby, took me to Sunday School at the Chapel of the Intercession.Eventually my sisters accompanied me.There were so many in the Sunday School at the time, that on nice days we would have our classes in the cemetery where it was cool and pleasant. 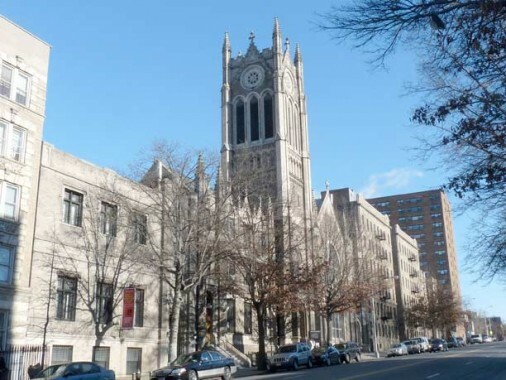 The Church, my beloved, Chapel of the Intercession, had so many activities for young people that as the years wore on it became a large part of our lives until we married or left the city. On Christmas Eve, a special service called the Feast of Lights was held. Our Vicar would read, “A visit from St. Nicholas” we sang carols and read prayers, and then the excitement began. The children and congregation, lining up with parents or teachers were given a lighted kerosene lantern to carry, as we processed behind the choir and clergy to the lower cemetery. Here wreaths would be laid and prayers and carols sung at the graves of Clement C. Moore, Alfred Tennyson Dickens, and Jacob Astor. It was a beautiful way to begin our Christmas Celebration. 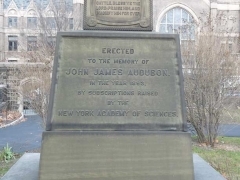 One more comment, the Audubon Memorial is at the side of the Rectory or residence of the Rector. It became the most familiar monument to most of us, as we took photos in the cemetery often. As for the caretakers cottage, it once housed the sexton of the Church, the last one I remember, was Ed Moore. 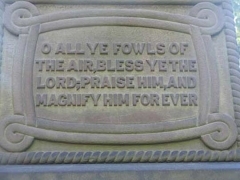 Thank you for a wonderful history of the my most beloved Church and Cemetery. Great website and information…thanks! However, there is a small error in one of the descriptions. Though living in FL since 1983, I grew up in the neighborhood across the street from the west portion of Trinity Cemetery; my apartment building can be seen in the 2nd image of this website. I also later worked for the school district in north Manhattan, and for the 1976 Bicentennial was tasked to develop a sound-slide presentation (don’t laugh…this was 14 years before PowerPoint) describing the Revolutionary War events that occurred in our area. 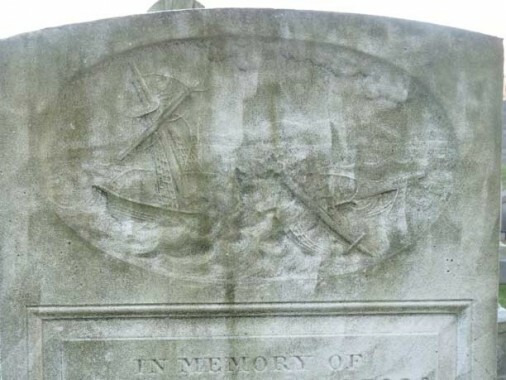 Wonderful story and learned a lot since most of the memorials come from Barre, Vermont, the granite capital and most of the craftsmanship come from the industry going back to the earliest days. Barre was the melting pot of craftsmen coming from the old country, Italy, Spain, France, Canada, Scots and Scandinavian countries. You would be impressed by learning more about the process from the quarry to the finished product and the infrastructure of the death industry.